Jesus knew the human heart so well. He knew how often we would base our personal and collective security on our surroundings. The Apostles fell into it before the day of Pentecost and today we still fall into it. It’s that great big pit called FEAR. It has the ability to paralyze us in our tracks and stop us moving ahead if we let it. Gone are the times of economical and political security. Our religious freedoms are being attacked on a daily basis. We watch and can hardly believe our eyes when we see one politician after another make blunders that will dig us into a deeper financial, spiritual or moral hole. The more we become educated about what is going on in the world, the more we have the potential to become overwhelmed by all the poverty, inhumanity and plain hatred around us. Knowing all this, some choose the route of escape. They no longer watch the news or expose themselves to situations outside their own family bubble. Other’s get angry and take up political arms or soap boxes. How are we to respond to all the chaos going on around us? The word of God has many words to address that. 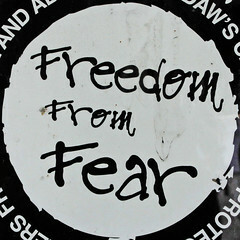 Despite the cause of fear, the answer is always the same…. Let’s look at a few verses and see…Phillipians 4:6-8 NIV 6 Do not be anxious about anything, but in every situation, by prayer and petition, with thanksgiving, present your requests to God. 7 And the peace of God, which transcends all understanding, will guard your hearts and your minds in Christ Jesus.8 Finally, brothers and sisters, whatever is true, whatever is noble, whatever is right, whatever is pure, whatever is lovely, whatever is admirable—if anything is excellent or praiseworthy—think about such things. 2 Thessalonians 3:16 NIV 16 Now may the Lord of peace himself give you peace at all times and in every way. The Lord be with all of you. John 14:27 NIV 27 Peace I leave with you; my peace I give you. I do not give to you as the world gives. Do not let your hearts be troubled and do not be afraid. 1 Peter 4:19 NIV 19 So then, those who suffer according to God’s will should commit themselves to their faithful Creator and continue to do good. These four beautiful verses alone, offer us the way for a follower of Christ to respond..We are to lay aside our anxiety and instead take all matters to God in prayer, not forgetting to thank Him for the answers. When we lay these things at the feet of Jesus we can rest and stop fretting, allowing God’s peace to reign! He promises to provide peace at ALL times and in EVERY way. It is available to us 24/7, regardless of our circumstances! We just have to rest in it. We are to replace our fear based thinking with those things that are right, lovely, admirable, excellent and praiseworthy! Finally, though we may come up against obstacles and oppression while we serve God, we are to continue to trust in God’s faithfulness and to keep on truckin’ so to speak! Don’t allow fear to keep you back from achieving what God has called you and set your apart to do! Despite what is going on around you, trust in the One who laid the foundations of the world and who has created you for a time such as this!